Panel blinds are sleek, stylish and perfect for larger windows. Offering all the privacy you need when closed, and a contemporary yet homely look when drawn back, panel blinds are a great choice for any room in your home. Panel blinds use top-fix brackets to secure the headrail of the blind in place. You can change the brackets to be face-fix, but this requires top-fix brackets being secured to a face-fix bracket extender - something not normally supplied with your blind. In a normal installation, you must make sure that there is a 40mm gap for the bracket that's not going to be interrupted by any obstructions. If your headrail (also known as the track) is over 1m long, two brackets should be attached 50mm from each end of the panel track, with just one screw fixing them to the wall. 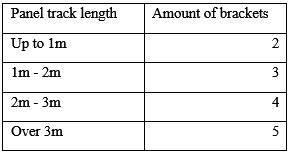 If your headrail is over 1m in length, see the below chart for the suggested amount of brackets used. These should all be spaced evenly along the length of the surface where you'll attach your blind. Whether you're fitting a panel cord control or a panel wand control blind, the fitting instructions remain the same. That is, until the very end of these instructions - where those with a cord control blind must follow some additional safety guidelines. Once you've assessed how many brackets are required, you can affix them as mentioned above. Ensure they are all well-spaced, and secured to the surface using the correct fittings. To pop the blind rail onto the brackets, simply make sure the rail is located near to the brackets as you intended when fitting them, and put the rail into the brackets. Once in, secure the rail track by rotating the turnbuckle on the brackets. All of the panels will have a Velcro strip across their top edge - use this to secure the panel to the track, starting from the back of the blind that's closest to the window. Repeat this with one panel at a time, building the blind up from the back forwards. For a split draw panel, simply Velcro the panels on from side to side instead of working from the back to the front. Finally, check that the panels line up properly across the bottom bar, and adjust the Velcro at the top if any panels need adjusting. When we send you your cord operated panel blind, we will provide you with a side-fix or face-fix cord tidy, and this must be installed as per the instructions supplies. This is to prevent the risk of strangulation that can occur with cord control blinds of any type, and should be fitted when your blind is installed.